Jeff Kaplan - Open ePolicy: Microsoft Stuffs OOXML Ballot Box in Sweden? Carpe apertio! Seize openness! Para agarrar o aberto! Open doen! Agarre la franqueza! 開放性を追求するため! 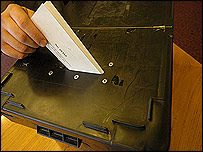 Microsoft Stuffs OOXML Ballot Box in Sweden? Sweden is the stage for the latest games being played as the ISO vote on OOXML approaches. Last minute arrivals (listed here) at the meeting of Sweden's technical committee tipped the vote in favor of OOXML. Is this Microsoft's fault? The real problem is that countries like Sweden (and Portugal before this) never established clear, transparent rules on who and how votes take place. And companies exploit this. Why? Because huge business interests are at stake, and they can. Microsoft gets its business partners to vote. Microsoft's competitors also show up to vote. They all pay their admission fee and vote. This is what happens when a vote that should be based on technical and public interest grounds is left to companies to decide. The basic question: why should companies vote at all on a country's position on a standard? Whether one standard or another best serves the public interest of a country is not an issue that should be decided by companies, which all have huge market and business interests at stake. This is a decision for government -- weighed by technical experts and decided in a transparent process by politically accountable officials. Unless otherwise noted, all content on this site is licensed under a Creative Commons License.